Thyroid disorders are very prevalent health problems among men and women alike, but many people suffer the symptoms and side effects of thyroid issues for years without realizing the root cause of their pain and frustration. Dr. Shemesh, the Medical Director at MindBodySpirit Care, specializes in holistic and integrative thyroid disorder management to help patients overcome various thyroid disorders in the most natural and efficient way. Thyroid nodules, goiters, hyperthyroidism, and hypothyroidism are the four most common thyroid disorders that impact men and women of all ages. The thyroid gland is a butterfly-shaped gland in the front of the neck that is responsible for using iodine to produce vital hormones that regulate a number of the body’s metabolic processes. A thyroid disorder can be identified by its tendency to affect either the structure or function of the thyroid in some way. 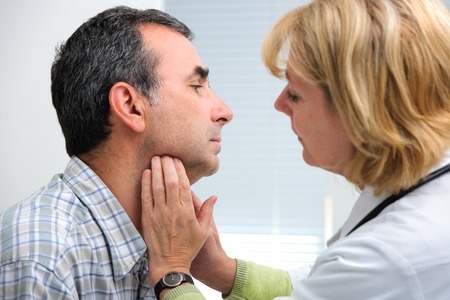 Thyroid nodules are solid or fluid-filled lumps that develop within the thyroid. Since these nodules sometimes produce too much of the hormone thyroxine, they can cause unexplained weight loss, increased perspiration, unusual nervousness, and irregular heartbeat. Goiters are caused by enlargement of the thyroid gland. They have the ability to cause difficulty when breathing and swallowing, coughing, and a tight feeling in the throat. Meanwhile, hypothyroidism and hyperthyroidism affect the thyroid in opposite ways. Hypothyroidism develops when the thyroid gland doesn’t make enough thyroid hormones to meet the body’s needs, while hyperthyroidism occurs when an overactive thyroid stimulates the production of too many hormones. An underactive thyroid might cause fatigue, forgetfulness, weight gain, muscle cramps, and dry skin and hair, but an overactive thyroid is known to cause weight loss, sweating, racing thoughts, anxiety, and sleep problems. There is no single or direct cause of thyroid disorders, which is why you need a holistic professional like Dr. Shemesh at MindBodySpirit Care in Tampa, Florida to help you uncover the root causes of your thyroid disorder and recommend a customized and natural management plan. Dr. Shemesh seeks to address your underlying health problems in order to resolve your thyroid concerns. By recognizing the body’s interconnectivity, it’s possible to manage and even reverse your thyroid disorder without relying upon pharmaceutical medication. Yoga, meditation, herbal supplements, strategic eating, acupuncture, homeopathy, and First Line Therapy can be strategically utilized to create an individualized plan that restores healthy thyroid function. With two locations in Tampa, Florida, MindBodySpirit Care is conveniently placed to serve all of your holistic and integrative healthcare needs. Call (813) 935-2273 or (813) 964-6804 to make an appointment and uncover the best ways to address your thyroid concerns.